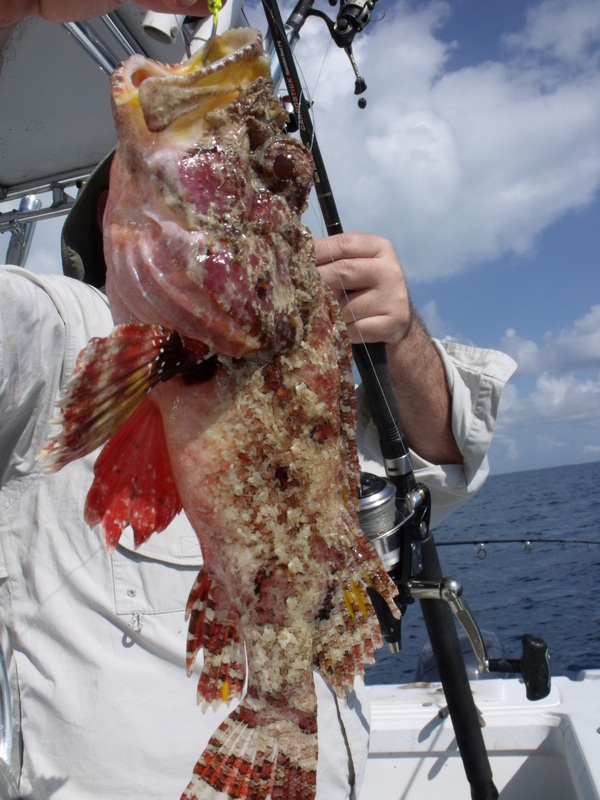 The one thing I still like about the Florida Keys is that the fish some times do not read the book as was the case the other day on the grouper wreck. 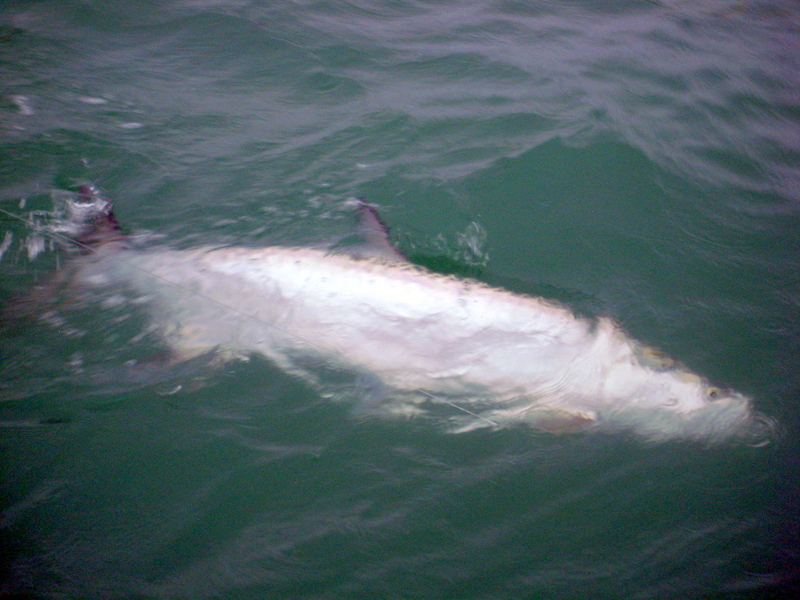 A group of tarpon from nowhere just appeared in the chum slick behind the boat. Not big bridge fish but solid hard fighting 60 to 80 lb and they were on the feed in the day time also not in the main tarpon book. As I said in a recent blog first run down for Arun fish on this one he lost but the next one after a very hard fight we had to the boat where the hook just fell out how lucky was that. 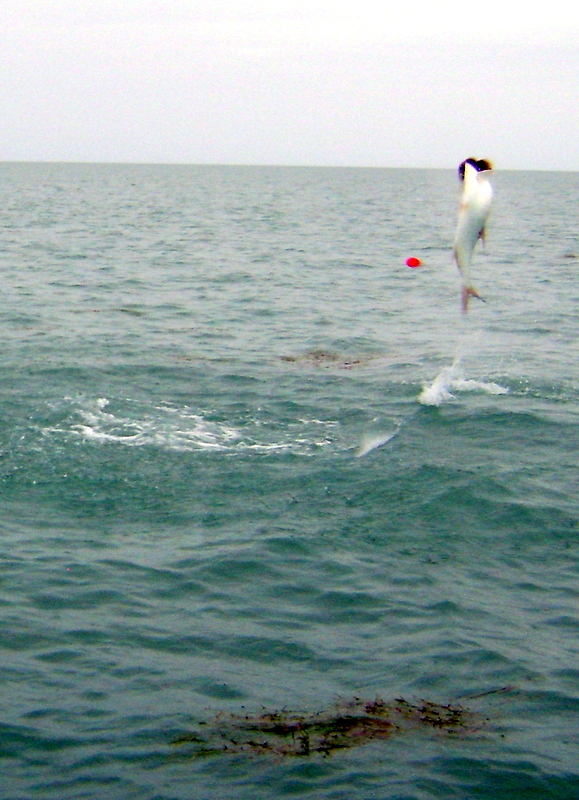 Dave did take some cool pics and any photo of a tarpon in the air is a good one. After the last blog had a few inquiries about grouper fishing and I think it would help to give a bit more information here. 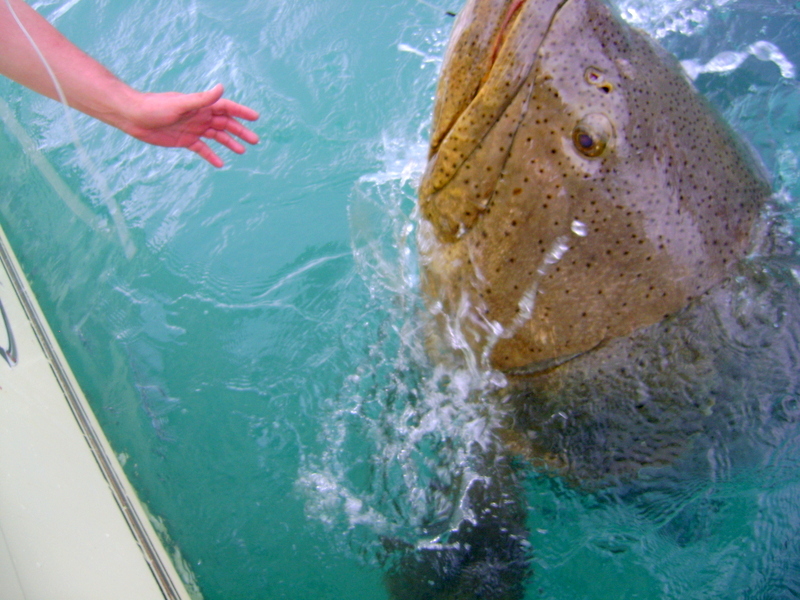 Goliath grouper fishing is not seasonal you can catch them any day of the year. They also live on certain wrecks and will never leave them so if you have the numbers you will always catch. It is also certain maths the bigger the bait the bigger the grouper all you have to do is just hang on. I only have a few places left this year so if you are thinking about coming over don’t leave it to late. 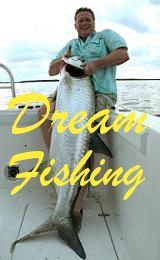 Sometimes here in the Florida Keys we have a days fishing that afterwards you ask yourself did that really happen was it a dream ? The other day started of as the rest of the week a strong wind and the threat of rain we are lucky here we can still fish. The choice was the banks in the bay or the bridges well we decide to give Bahia Honda a go, maybe the cafe had something to do with it. 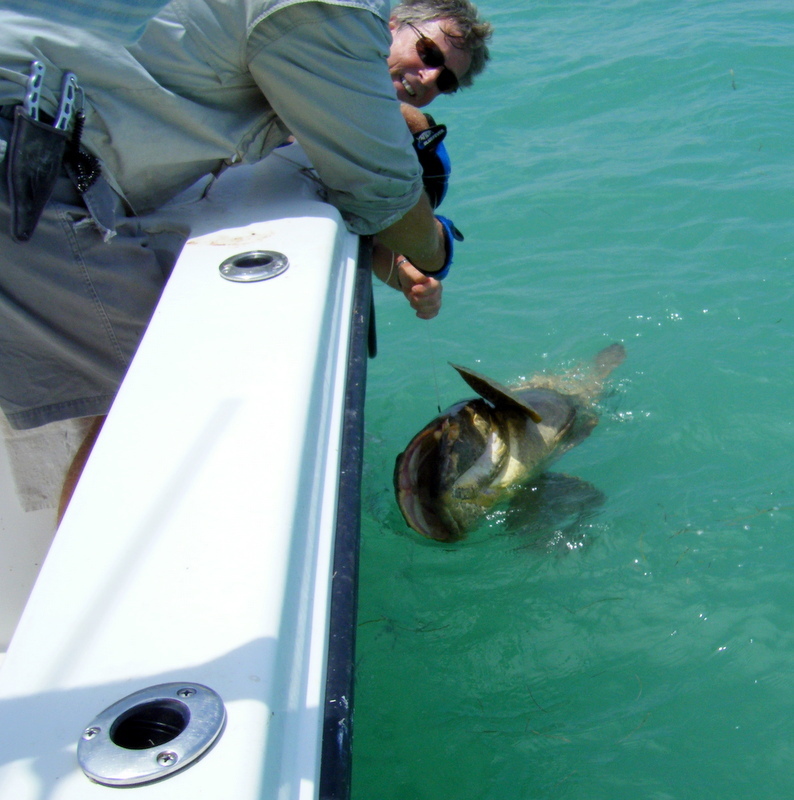 Bahia Honda is the deepest bridge in the Florida Keys and the main channel goes to 23 ft which is why during the season you can catch big tarpon all day. 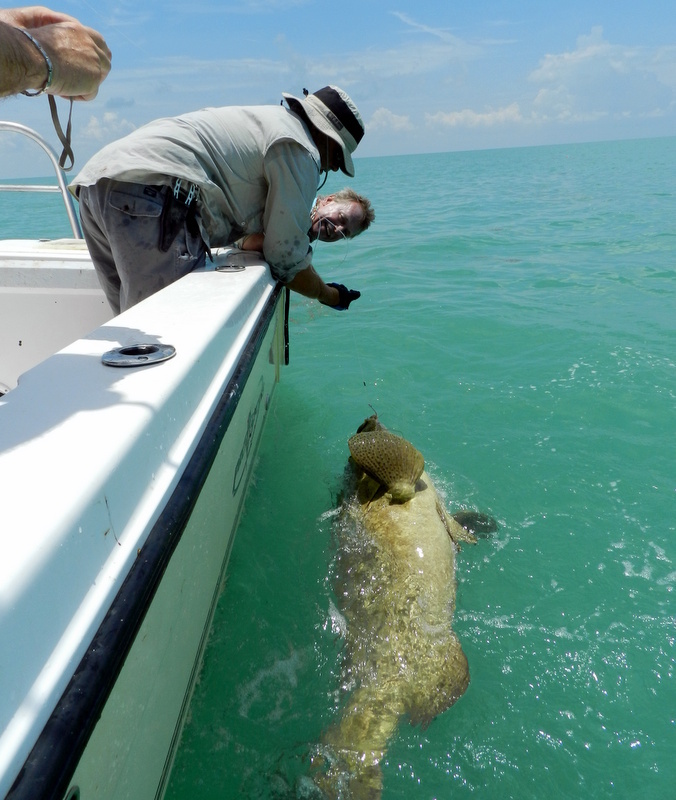 Also it has a population of very big goliath grouper so much so that a university put an underwater webcam to study them. Over the last year I have been watching a very big fish on a regular basis and in the back of my mind I have had a plan. 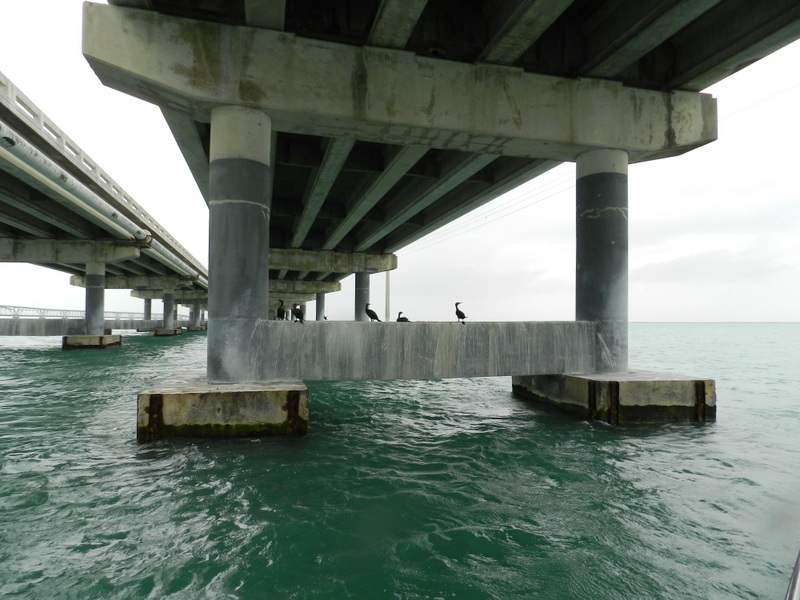 The only problem with Bahia Honda is as many a tarpon angler has found out is it has a lot of concrete two road bridges and hundreds of piles. Well we got there and it was slack water so of to cafe for a quick lunch then back to the bridge and yes we were very close to the webcam why not. A few small snapper then I said anyone fancy ago at a big grouper so over went our big 80 lb braid rod and a big bait on a 22/o circle hook. On the first run down the float went and using a 2 lb bait you know it will not be small so fish on and Dave was in big time. As I expected the fish went straight between the piles so we slipped the pick and tried to drag the fish out. I have to give Dave 11 out of 10 for effort and yes he dragged the fish out. What happen next was very strange we all expected the fish just to go straight back but no it just swam out into the open water why I have no idea maybe it just felt sorry for us. Well we got it to the boat and what a fish big or what in fact maybe the biggest we have ever had. I have shown the photos to locals who all say way over 500 lb how much some were saying even 600 lb all I know is the fish of many lifetimes. I have to say to the university sorry but I had to give it a go but thanks for giving a Brit on a fishing holiday a fish of his life. Despite the wind and rain ( yes it is the wet season ) we had a dream day yesterday. 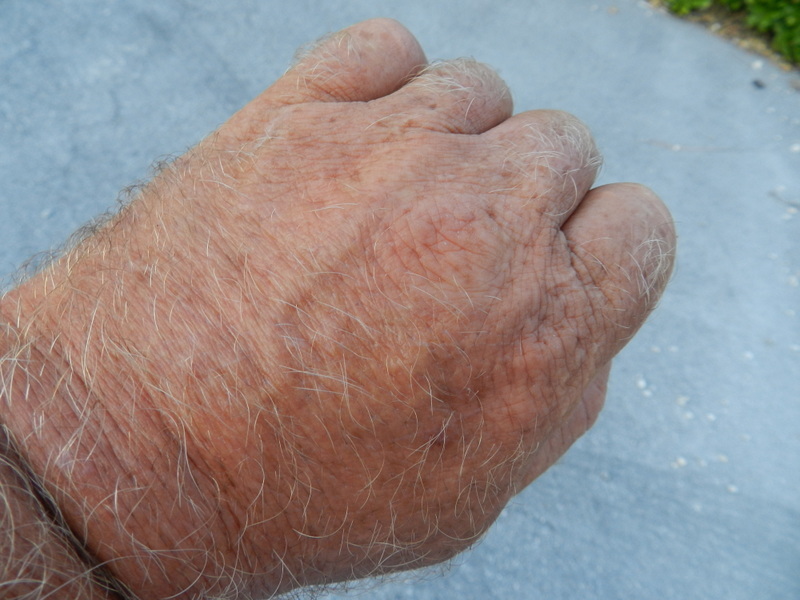 The only problem with return guys on fishing holidays here in the Florida Keys they do remember the good weather. All I can do as a guide it try my best which I think I do the only thing I cant do is change the weather. 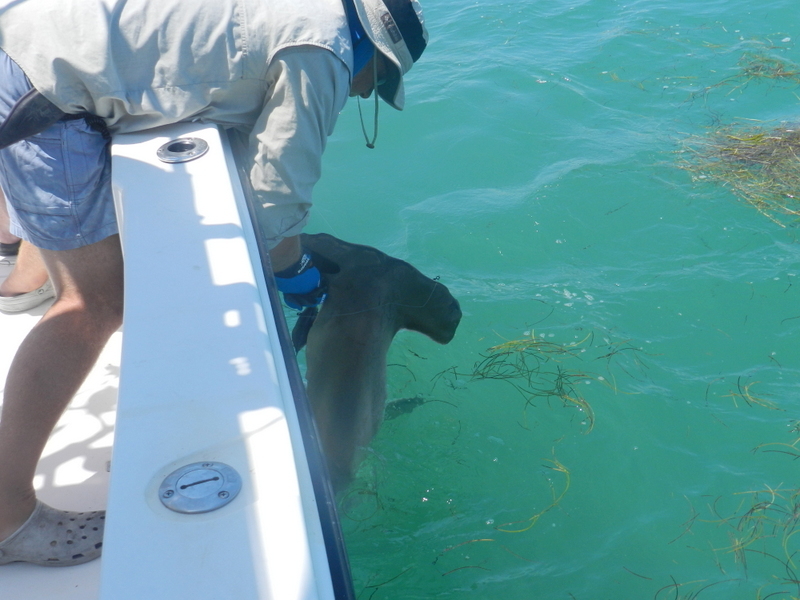 Well the plan was to get some big baits have a go for barracuda then target some goliath grouper. The wind was a bit strong but Dave nailed a stunning 26 lb cuda on the tube lure, why are there big cuda on this spot I don’t know just love it and enjoy. The only problem with the grouper baits were nurse shark and why do I say it but every time I say what about a group shot I regret it but it does make a cool pic. Well it was off to the old favorite spot for goliath and they were there big time I lost count but Arun had a 150 lb + on a small shark bait these fish will eat anything. High light of the day was what happened next, down the chum slick a tarpon rolled. In a blur Arun had a bait out and first run down the float went, tarpon on then tarpon off just love it. Second run this one stuck despite the fish wrapping round the props we had it to the boat a cracking fish about 60 lb. 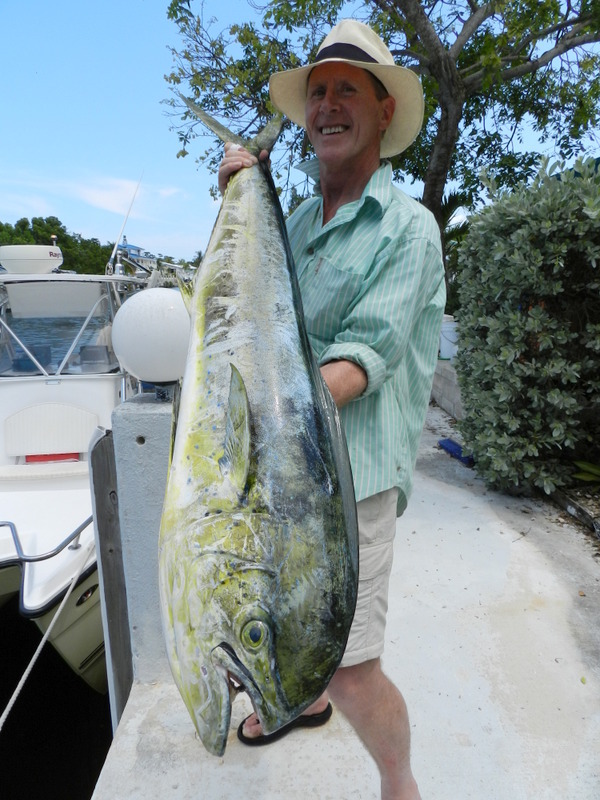 Dave even managed a pic with the fish full in full air pics to follow, despite an other wet day in the Florida Keys back to the dock with some very happy anglers, job done. Here in the Florida Keys sometimes the fish can bite back. Yes anything with can and will bite back I have seen a shark less than 2 feet long take a big bite out of an angler. The teeth of all our mackerel are very very sharp and just a glance will produce a deep cut. Then we have a few that can inject venom and cause serious pain. I was one the wrong end of one of these the other day our Spotted Scorpion fish to give this sucker its full name. In all my 50 + years on this planet I have never felt pain like it. 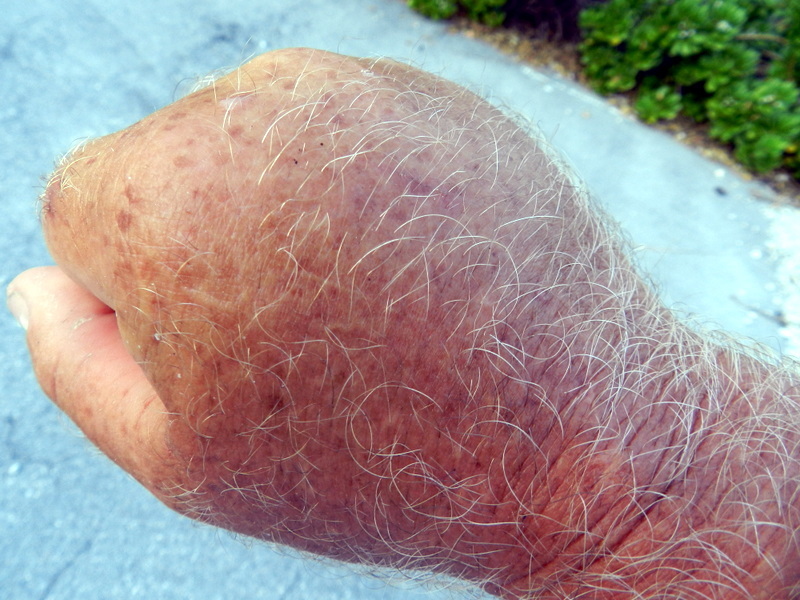 First my hand swelled up then went totally paralyzed not nice then the arm started as well. Back at the house I just had to load up with drugs and the swelling slowly went down as did the pain. I can tell you all next time anyone has one of these I will cut the line at the reel !!!! 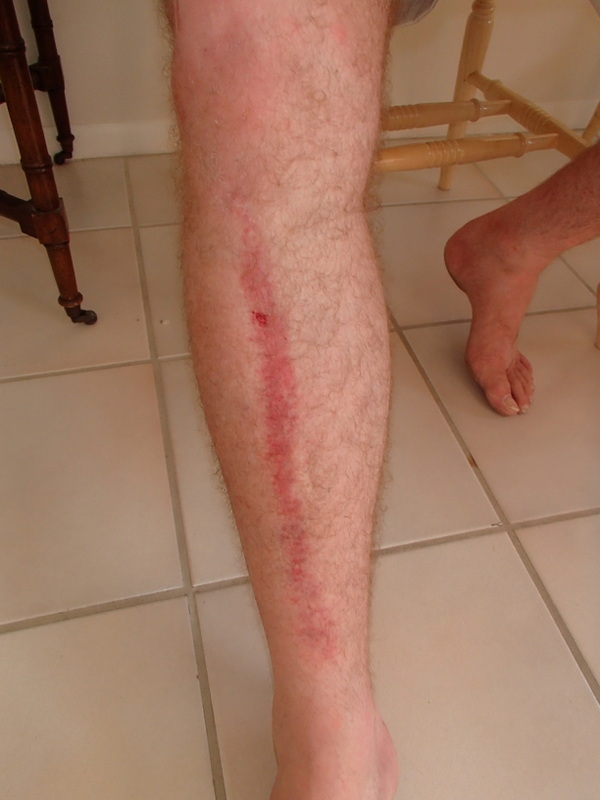 Who said that sea fishing is not a dangerous sport has not been to the Florida Keys. Anything big and nasty that lives in the sea normally does not like being out of it and all we want is a quick pic sometimes wont work. Yes over the years of doing fishing holidays I must have handled hundreds of shark but once in a while it can go pear shaped. The first time many years ago after a long hard fight my guide said to me would you like him in for a quick pic. 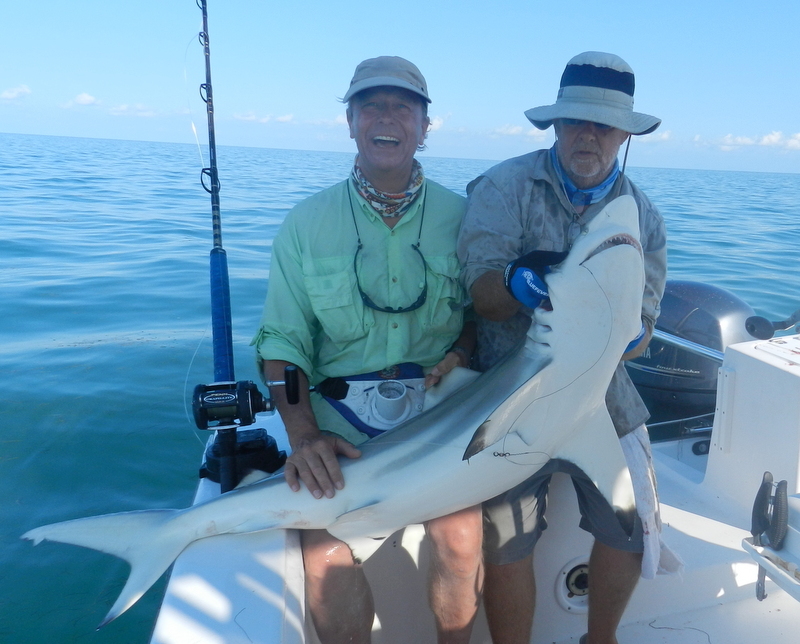 This hundred pound plus blacktip had beat me big style and now the guide said would I like in on my knee mad or what. How ever there is a way to hold them that nearly sends them to sleep and they all go back so strong. The other day with Robin we had that hammerhead that was a touch camera shy. Top marks to Robin he did not let go but the fish did manage to give him on hell of a tail swipe. As you may or not know sharks skin is actually made of mini teeth very rough one way and was used to finish furniture in past times. This is the one reason I am happy to get them in for the money shot, no scales or slime. 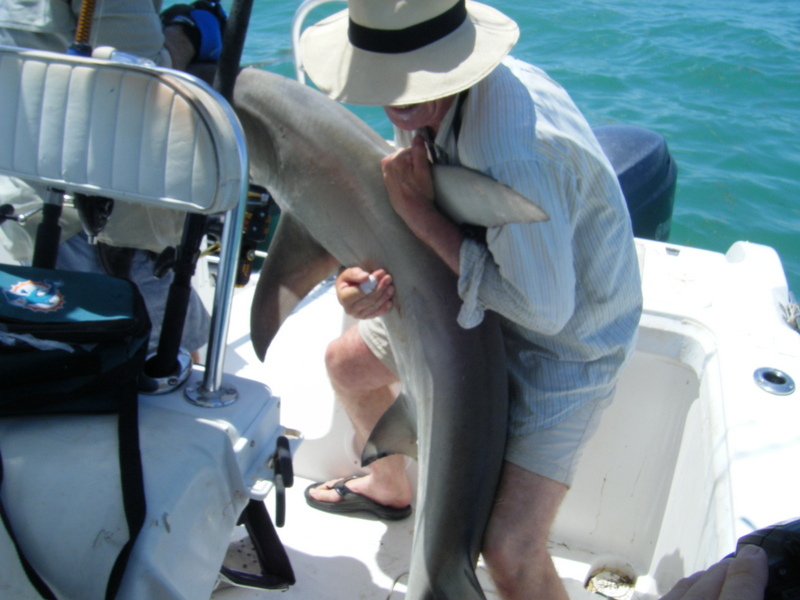 I am trying to get the photo of a recent 200 lb shark that was bitten in two by a bigger one in the Florida Keys scary or what. Back to poor Robin the only problem he will have to drop his trousers to let people see the scar at the pub, what a pick up line !! At last someone in the UK is speaking some sense on bass conservation. After reading Henry Gilbey’s blog yesterday I have to nearly agree 100 % with what he said. I have been lucky enough to fish with Henry many times and yes he is as mad as they come but you would be hard to find any one with more passion for fishing anywhere. I am very lucky to live and work in a part of the world where long ago they realised that you can only eat a fish once but catch it many times. If you want to conserve fish then the Florida model is very good, they quickly found out how important the big fish are and the slot regs came out, fish which needed more help were given no take seasons. I admire the Irish bass closed season but stopping people from fishing for one species in the sea I am not sure about. Bag limits are also a very important part of the plan as are regional variations if a fish needs help drop the bag limit till it recovers. 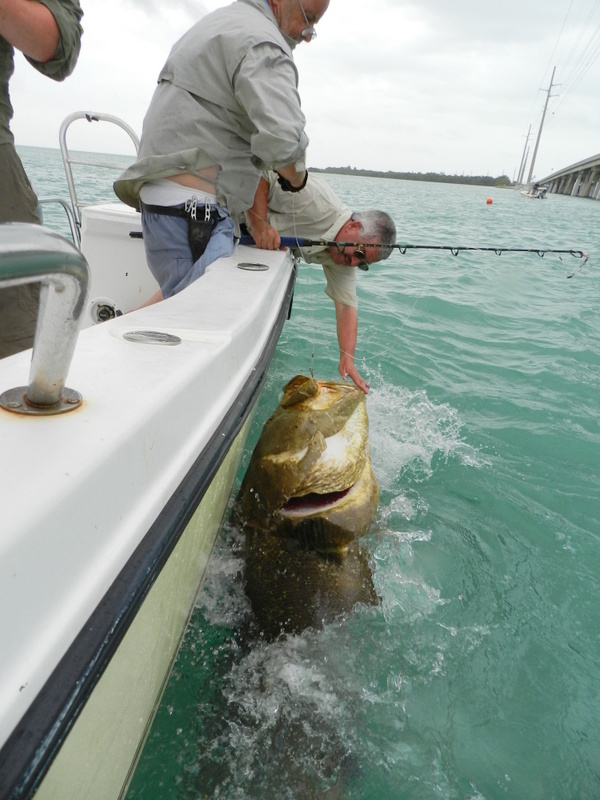 Here in the Florida Keys we have had a four month grouper ban for the last two years and it has made a difference. Spotted seatrout have been the most recent success story with a slot size, bag limit and a closed season they have come back big time. In fact they have been doing so well the state has removed the closed season and you can enjoy one when ever you want. Well I hope Henry’s blog makes some people think please, please put the big bass back it will make a difference. Maybe things will never change and there will never be regs in the UK but you one your own can make a difference and it will work and if other people see you put a big fish back it might just catch on. Looking back through photos of an amazing fishing holiday that Simon, Geoff and Robin had the other week one fish seemed to say it all. 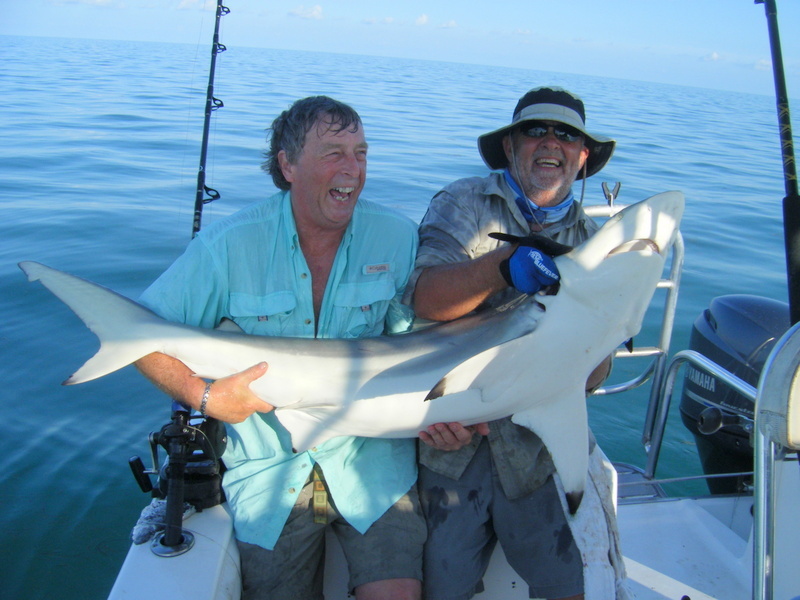 While I love my tarpon and permit and all the other game fish in the Florida Keys the good old blacktip shark seems to tick all the boxes. I suppose if you had to design a game fish it would have to run hard, jump , grow up to the magic 100 lb, and give a fair fight. Well this fish does it all and then some. 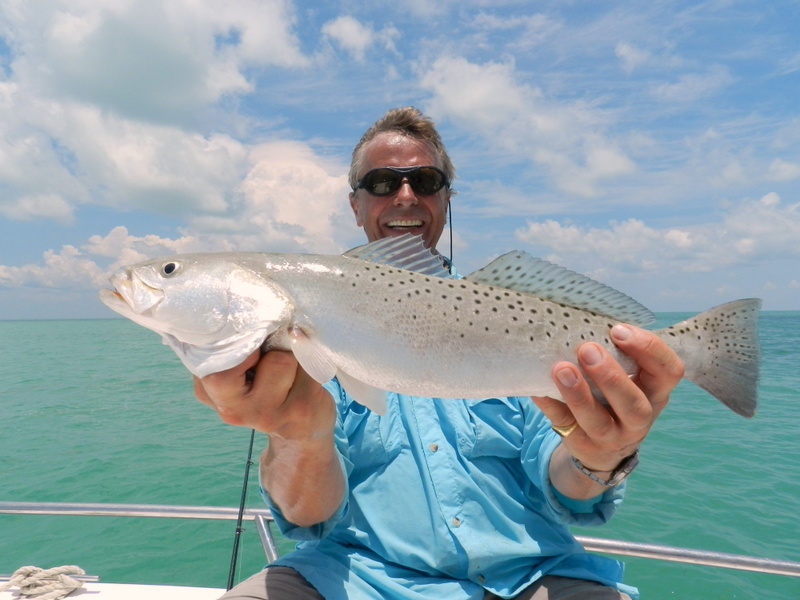 We are very lucky in the Florida Keys that they are here in numbers all year and are a relatively easy fish to target. We have them on both sides of the island but I think they are so much more fun in the less than 10 ft waters of the Florida bay. We catch them in open water not near any line breaking concrete and you don’t need to be near any wrecks either. Just lots of good chum and we drip neat oil into the sea as well if the wind is going in the same direction as the tide. As with all fishing the more run the more fun and normaly within 30 mins or so they will appear. Depending on average size sometimes if they are only in the 30 lb range we can go down to just 20 lb gear now that is fun just hoping there is enough line for that first screaming run. If they are in the 100 lb range we need the 80 lb gear I know it seems a bit over the top but believe me you need it the power a big blacktip can make is amazing. As I said in my last blog the numbers of these fish are very good and in some areas huge amounts of small fish which means their future is also looking very good. 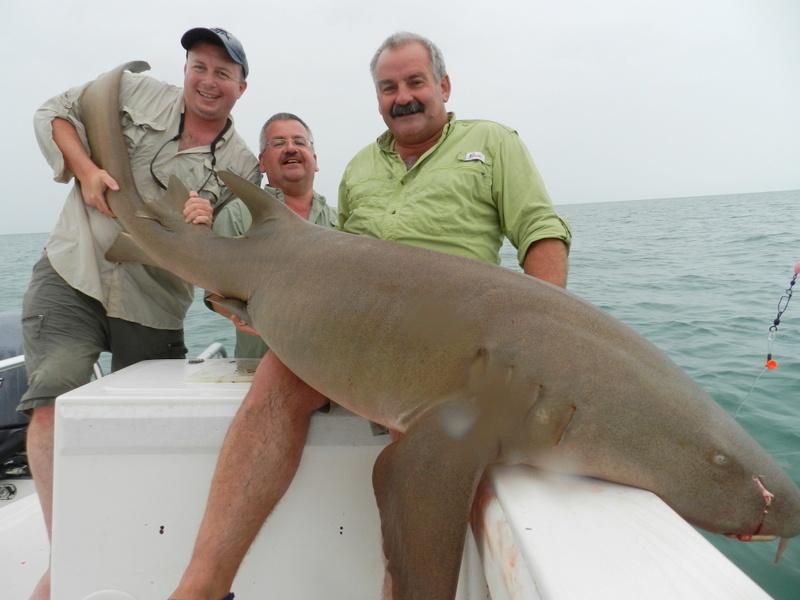 There is one shark we catch in the Florida Keys that I think is one of the most stunning that is the hammerhead. Robin was had one the other day in the bay while it was nowhere near the size of Lee’s 1000lb + from a few years ago it still put up a very hard fight on light gear. The one nice thing about these size fish is they are very easy to handle and you can get a very good hold on the hammer. Well this one had not read the script and came in ok then all hell broke loose, top marks to Robin he was not going to let go and after a short time we were able to get the money shot. All the shark we bring on the boat go back very well and not having scales or slime are more than capable of this treatment. 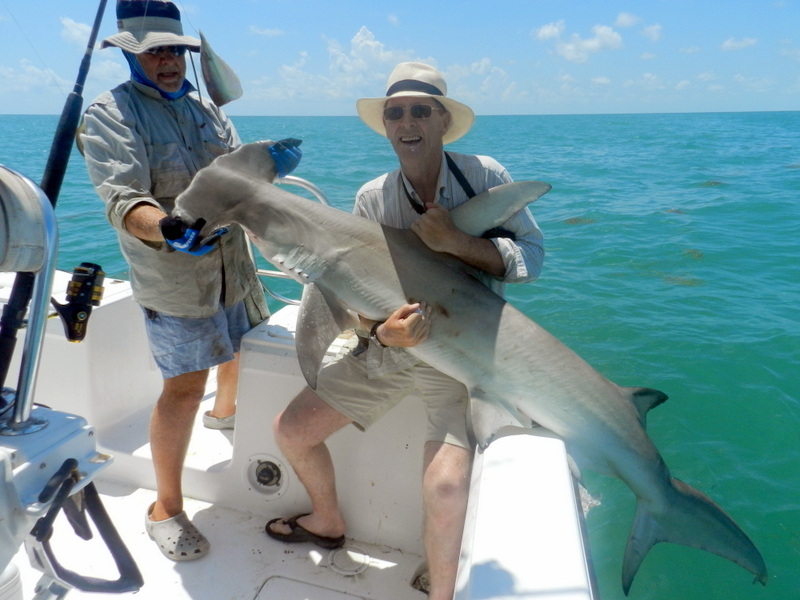 While there are many people who say shark are in decline here in the Florida Keys this is not the case at all. In fact in some areas they are on the increase and with a boat PB now 68 in one day we have very good stocks. The sharks regs were changed a short time ago and maybe this is all ready showing in the numbers. Yes I have eaten shark and it is ok but there are so many better fish to eat I will never take a shark again. 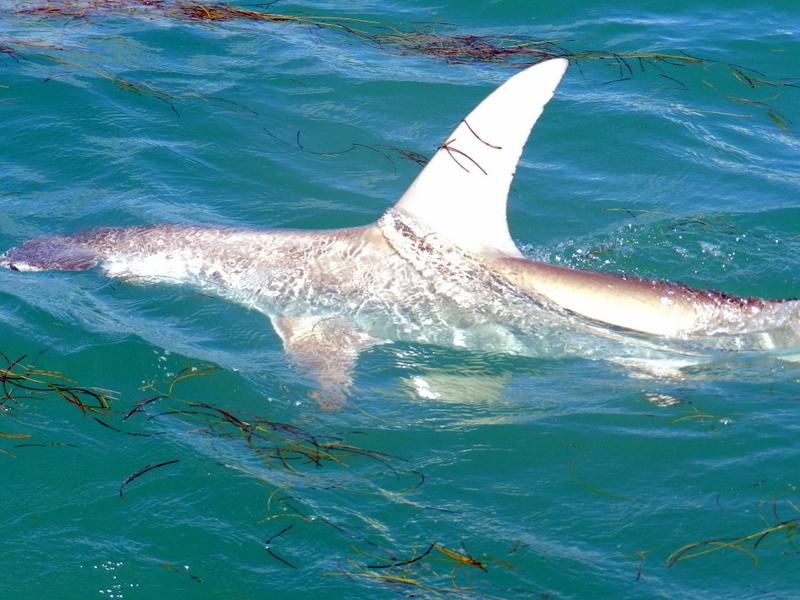 What I do like to see is the big numbers of small shark we find in certain spots you just have to tell yourself this small blacktip will only get bigger and more fun. On young Robin’s tick list was tuna and dorado so one day last week we got the boat ready for an early run in the dark to the tuna grounds. Well at 4.30 am it was touch and go the seas were a lot bigger than I like and running 25 miles in the dark and big seas not fun but we were all up so what the hell. It did mean our speed was well down and we were going to get there late I like to arrive just as it is getting light and it was well light when we arrived. The seas were rough water was hitting the humps at nearly 6 knots and in nearly 1000 ft a large mass of water hitting a 500 ft mountain can only go up. What was strange was very few birds meaning the tuna were down or just not there very strange for the west hump as we call it. We tried all the methods but no tuna so a short run to the east hump so 6 miles away. Again very rough water from the current but I had two hard hits on the jig then we all saw a very big dorado in the very clear waters offshore they stand out so well. Out went two trolling rods and very soon Robin shouted fish on at the same time Simon also said fish on so two rods and two fish on. 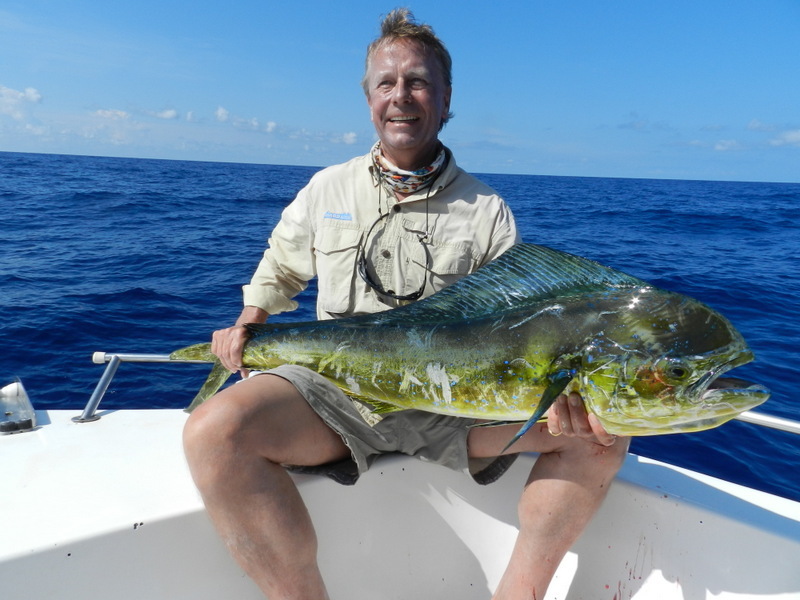 A very spectacular fight and lots of jumps it even ended with the fish jumping in the boat and it is not easy to gaff a fish in the transom well but I did and what a cracking fish. What did come as a surprise was it the same fish that had taken both baits such is how hard these fish feed in their short lives. Back on the dock this fish weighed 24 lbs so with blood loss about 26 to 28 on the boat a stunning first dorado. On the way back home we found some weed and some small dorado but nothing like the first one. Robin said I am just leaving something to do on my next trip now that’s what I like to hear. Its amazing just how quick a fishing holiday here in the Florida Keys goes and despite the guys staying for 10 days it was the last planning meeting and is there anything anyone wants to catch question. Well Geoff said I would still love to catch a big grouper and lucky for me that is a very easy box to tick. We have the wreck and thanks to old friend Jim Whippy we have the method that works and we have had many massive grouper. So with flat calm seas ( the boys have been very lucky with the weather ) off we went 20 miles into Florida bay. With calm seas it is a lot easyier to get the pick right and soon the boys were on bait so all ready. So Geoff was the firstguy on the grouper rod and it was first or second run down that lovely bob bob and float away just hold the rod and the circle hook does the rest then fish on and the Whippy walk to drag the fish out of the wreck. I have been told I sound unreal when I say its only a small one about 150 lb but for this wreck at 150 lb it is small. Fish to the side of the boat and photos taken and one very happy angler and the box ticked just how cool is that. Simon said I think I could manage one a little bigger so all we have to do is just use a bigger bait and very soon he was into a bigger grouper. This wreck still leaves me head shaking all this is going on in 10 ft of water and I am sure there are fish to 1000 lb on it. Simon’s fish was in the 250 to 300 lb range a stunning fish by anyone’s standards so two very tired but happy fishermen. 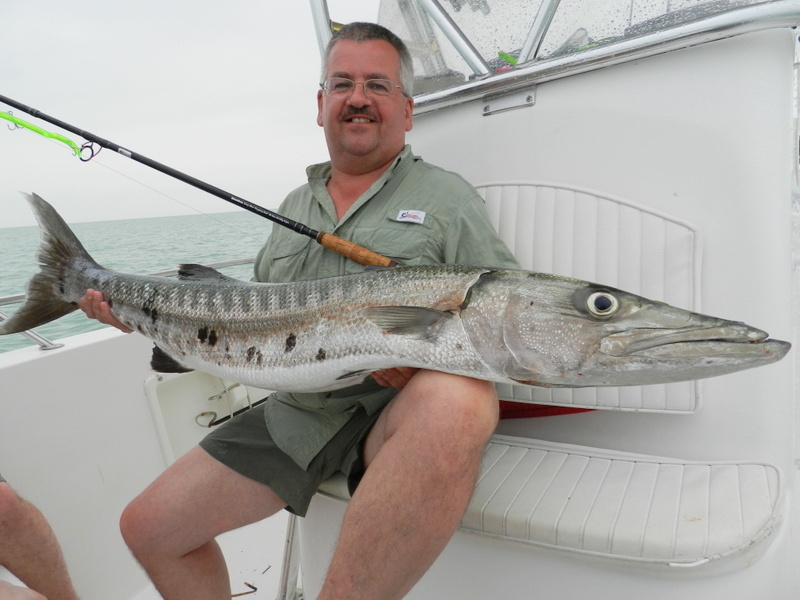 Robin had had one the other day and he said one of those brutes is enough so it was off to play with the barracuda again.